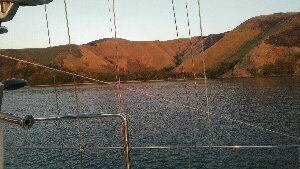 Beautiful small bay on the stunning yet barren island of Flores, Buda Tenggara, ID. Very quite. The small village has no electricity and few boats. Kids paddled out to visit this morning and brought bananas and rose apples to barter for coffee and sugar.